How to Train Your Kids for School? Home \ How to Train Your Kids for School? Most parents must be prepared already for most of the school requirements like uniform, books, other supplies and meals. However, there are other things that you should be preparing for, for your kids, which play a big part for their performance, not just in school but also at home. And one factor is for the health and sanitation. One quick way is to teach your child the basic rules in cleanliness. This way, you can be assured of three things: (a) lesser chances for your child to get sick, (b)less worries and headaches for the family, and (c ) better performance in school for your child. Here are few things you need to remind your kids when their school (or even outside your home). 1. To clean their hands BEFORE and AFTER eating. This constant practice alone can save tons of worries and headaches for you and for your children. One of the most common things that kids do whether their outside or at home is often forget to clean their hands before and after eating. Most of the time, kids do tons of stuff like playing, touching floors, objects and all sorts of things that they acquire lots of germs and harmful bacteria into their hands. Your kids will be facing numbers of activities at school from sports and physical activities, art, home economics and sometimes science experimentations. All of these activities, big or small, long or short, CAN and WILL definitely make your children contact their classmates and some equipment that may not be as clean as you think. Another activity is going to the comfort room. Teaching your kids to NEVER forget cleaning their hands after they go the toilet can drastically lessen the chances of your children getting any harmful disease. Teach your kids to clean their bag and their school supply when they get home, especially those they often touch and hold like pencils, pens, books, notebooks and jugs. Cleaning their lunch boxes and bags daily can lessen the chances of germs and harmful bacteria to increase on these school items. Discipline the goods to practice good hygiene in and out of your homes. Cleanliness of the body plays a big role in maintaining good health and lessening the chances of getting sick. It pays to be a little paranoid, especially if you’re a parent. Better equip your children with the right mental attitude of cleanliness and equip them with the right tools. For your peace of mind, give your kids QUALITY products that can assure your child’s or children’s protection at home or outside your home. Wrap into your kids bags either Puregel or Bactigel hand sanitizers for easy, fun and fashionable way to clean their hands anywhere they are. With its 68% ethyl alcohol, Puregel and Bactigel have the HIGHEST alcohol content in the locally-produced alcohol-based hand sanitizers, assuring you of 99% germ-killing effect, lessening the chances for your children to get sick from hand contact. Plus, Puregel and Bactigel are FDA-approved giving you assurance of the high quality standards. (FDA – Food and Drug Authority). Teaching your kids to use Puregel and Bactigel hand sanitizers before and after activities (eating, playing, going to the comfort room) for that fast-acting and effective way to kill those germs from your kids hands. 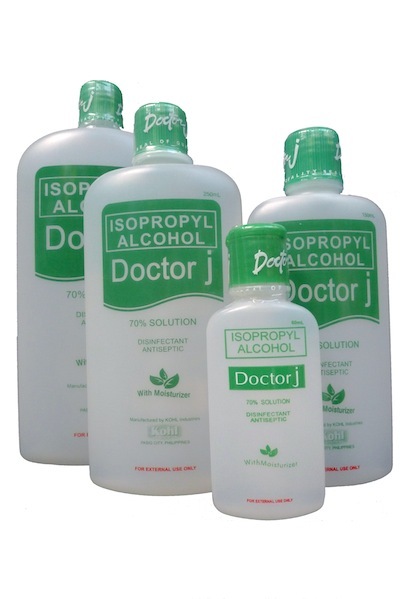 Another thing you can use is Doctor J Alcohol (ethyl / isopropyl) to clean your kids hands and other body parts. Using Doctor J Alcoholalso on your children’s school supply can eliminate colonies of germs to populate even more into their things.